Didn’t manage to fanagle your way into the Oscars? For all us commoners – or those who didn’t pass the background check – the next best thing is to corral friends together for a viewing party across the street. 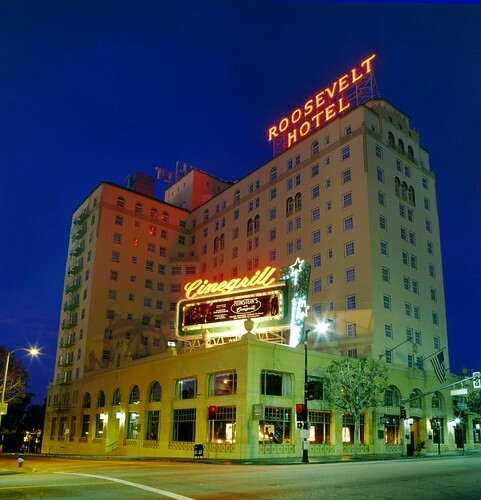 The Roosevelt Hotel will be setting up screens in the lobby, Dakota and 25 Degrees for your viewing pleasure. And before I send you intoÂ theÂ flustercluck that is Hollywood on Oscars night, just be aware of the street closures in the area and be sure to carpool or Metro it on in. They all sound so delicious, I’m going to have an extremely hard time not trying the whole menu. Metro, indeed!! This entry was posted in cocktails, Food, Hollywood and tagged 25 Degrees, cocktails, Dakota Chop House, Hollywood, Matt Biancaniello, Oscars menu, Oscars specials, Oscars viewing party, Roosevelt Hotel, The Roosevelt. Bookmark the permalink.